We present you an effective software solution for arbitrage between brokers. The Arbitrage on the FOREX market became widespread due to decentralization. There are many liquidity providers, whose quotes differ for various reasons. By tracking the dynamics of changes in the quotes of different brokers, it is possible to determine the delayed and leading brokers, thereby predicting the future prices of the delayed broker for a short time. Knowing these prices and using efficient built-in software filters, it is possible to perform arbitrage trading operations. The main advantage of our trading complex is the usage of only the regular means of the MQL4, so there is no need to install additional programs on your computer. It is sufficient to install the EA on different terminals of different brokers, specify the operation mode: trading or slave mode, to configure the intuitive parameters in the convenient panel and start the analysis and/or trading. Convenient user panel which displays all settings. "Hot" change of the settings, without restarting the EA. The panel stores the settings for each symbol and loads them at a restart. Additional indicator which displays the quotes of the current and all connected brokers in different visualization modes. Possibility of arbitrage between all available instruments, including FOREX, CFD's, Commodities. 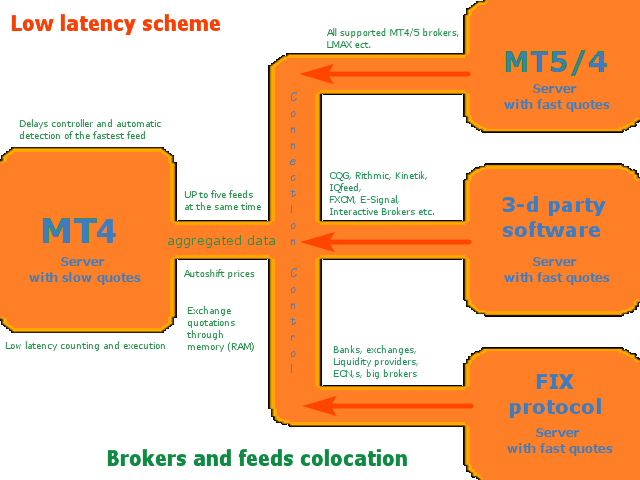 Connection of up to five brokers simultaneously into one Mater panel, with automatic signal sorting and trading using the best of them. Possibility of trading limit orders without slippages both in the normal Bid-Ask mode and within the spread on the accounts with zero stop levels. Control of the slave servers freezing, therefore, protection against false trades when the quotes become delayed due to freezing. Measurement of the quotes delay time in milliseconds and the ability to set the minimum threshold, below which the trades will not be opened. Attach the EA in the “Trading account” mode to the chart of the required symbol of the selected broker (supposedly delayed). Trading will be performed on the delayed broker. The main panel will appear on the chart. Add the free Arbitrage Visualiser Pro Indicator to the chart. Select one or more slave brokers, install their terminals beforehand. Attach the robot in the “Slave account” mode to the charts of the same symbols to all the slave brokers. Edit the fields with the server name as you wish, for ease of display, or leave unchanged. Copy the names of the slave servers to the fields of the main panel. If everything was done right, the “Connect” status will be displayed, values will appear in the fields Dev (deviation), Мax, Min and Delay(delay in milliseconds), also the indicator will start displaying the current prices of all added servers. You can perform these operations for any symbol of any broker, without any limitations. At first start, it is recommended to disable the trading and wait for the robot to accumulate statistics in the Max, Min and Delay fields. This should be done on a market with as much volatility as possible, in that case the greatest deviations will be clear. It is also recommended to monitor the indicator and visually determine if the trading broker is delayed from the others (the orange line will be delayed or leading relative to the others). After some time it will be possible to determine the broker and the “Open criteria” criteria both for buy and sell orders. Considering the slippages, commission, high ping and other factors affecting the speed and quality of market order execution, it is recommended to set the values in the “Open criteria” Max and Min not lower than 40 and not greater than -40, respectively, so that the signal could cover the spread and commission. It is recommended to set the Delay parameter no less than 2 times greater the ping to the server of your broker. It is also necessary to consider that some account types have slow execution, and they may not be suitable for arbitrage. Struggling to get hold of the Author for a system fault...... even Twitter acount is old. Want this to work but support is bad. Dont recommend support at all. Go thold of Author. Good help. Thanks. Have tried other arbitrage systems but the problem was always the feeds. This basic system setup is easy and the feeds give good results. For quicker feeds, maxim setup for me and is running like a charm. Would highly recommend if looking for an arbitrage system . 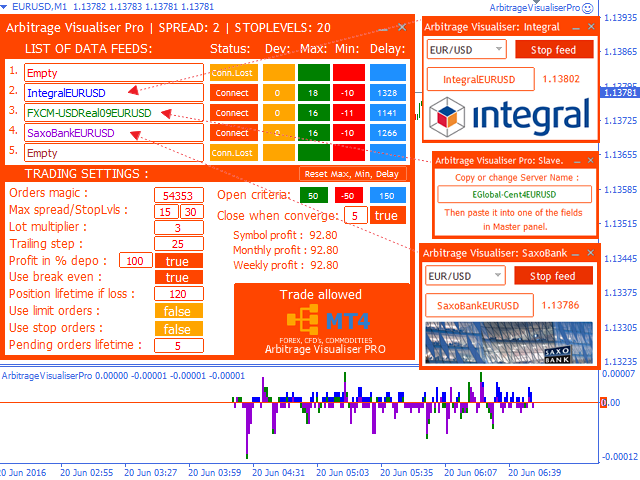 Added support for feeds Rithmic, CQG, Kinetic, Trading Technologies and others. Added the ability to trade stop-orders. Added the ability to close profitable orders by convergence. Added the ability to transfer data via the RAM (RAM disk). Improved the speed of signal calculations for a faster operation of the EA. Added convenient comments to the Experts tab. Added the ability to determine the slippages.